(September 16, 2016) The Charlotte City Council is scheduled to hold Public Hearings on three rezoning petitions in Steele Creek beginning at 5:30 on Monday, September 19 in the Council Chambers in the Government Center at 600 E 4th Street. The meeting will be broadcast on the Government Channel. Live streaming, the agenda, and other information is available here: City Council Meetings. Petition 2016-100 - MVP Properties plans to build up to 410 apartments on 41 acres south of RiverGate Shopping Center. The development will require two bridges over Hoover Creek, one on Walker Branch Drive and one on Rivergate Parkway. The developer plans to pay for one and the city will pay for the other. The developer will dedicate a 100 foot buffer along Hoover Creek to Mecklenburg County Park and Recreation Department for a greenway trail. Public streets in the development will connect to streets in the single-family Chateau neighborhood currently under construction to the southeast by Lennar homebuilders. The property currently is zoned R-3, but the Steele Creek Area Plan calls for up to 8 dwelling units per acre. It is within the RiverGate Mixed Use Activity Center boundary. This petition is Agenda Item 25. Petition 2016-116 - 124 townhomes on 15.87 acres on the east side of South Tryon Street across from Beam Road. 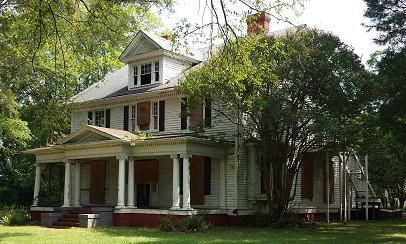 This property is the site of the McDowell House, which was the home of Jane Parks McDowell, who rode with her two-year old son in 1780 to let Continental forces know that the British were leaving North Carolina. See Save the McDowell House. The back part of the house is the original log cabin dating from the late 1700's. It has been added to and remodeled several times over the years. Unfortunately the house is badly deteriorated, and it would cost 100's of thousands of dollars to restore. The owners are not willing to pay for the restoration and plan to tear down the house. They have agreed, however, to donate the house and appropriate land to anyone willing and able to make it into a usable, attractive property. The property was rezoned in 2006 to allow construction of 83 detached houses. (See Petition 2006-149 Site Plan.) That existing rezoning requires that the house to retained as a clubhouse. This petition is Agenda item 21. Petition 2016-122 - Industrial property on the northwest side of Steele Creek Road and Ed Brown Road. Part of this property was rezoned in 2015 to accommodate outdoor storage of tractor trailers, but the owners chose not to proceed with that plan. (See Petition 2015-033.) The new rezoning petition would restore the original I-1 zoning for the parcel rezoned in Petition 2015-033 plus two residential lots next to Steele Creek Subdivision. Local ordinances require a 100-foot buffer (or 75 feet with a berm) between the industrial buildings and the adjacent neighborhood. This petition is Agenda item 34. For a listing of rezoning petitions in Steele Creek see Steele Creek Rezoning Petitions. For a list of all current rezoning petitions in Charlotte, see 2016 Rezoning Petitions.